When you have thick, dry, curly, thirsty hair like mine, conditioner is your one true friend in a world of enemies, namely tangles, humidity, frizz and fly-aways. Everyone's hair is different, but mine craves conditioner. 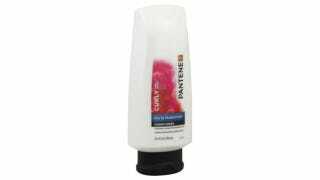 And that conditioner, without fail, is Pantene Pro-V Curly Hair Series Conditioner, Dry to Moisturized. There are many different conditioners out there — some cheaper than Pantene, some more expensive — but I feel that Pantene has the thickest, richest, most moisturizing formula, for the money. Conditioner that is thin and runny just won't cut it. One of the hardest things to achieve when your hair is curly is shine. Shine usually is the realm of flat, straight hair. But with Pantene, I have shiny, bouncy curls. Conditioner is key. Of course, conditioner is a tool, and only as good as how you use it. First and foremost, you need a good haircut. My hair was dull, a lot drier and harder to manage back when it was long. My relationship with Nunzio Saviano at the Oscar Blandi salon is one of the longest relationships I have ever had in my life. It's been almost twelve years since he chopped about seven inches off of my hair, and with regular maintenance, it's been well-behaved and lively ever since. Using his scissors, thinning shears, and Neapolitan charm, he keeps my hair healthy and looking polished. I've had a lot of stylists say, "Oh, curly hair, yikes." Nunzio was the only one who said, "I love curly hair!" Hence my loyalty. Second, but equally important: I hardly ever shampoo. Shampoo is for cleaning your scalp, and my scalp is rarely dirty. If I do shampoo (maybe once a month? ), I use a pea-sized amount and rub it into my scalp with my fingers, attempting to avoid my actual hair, which will just dry out more if the shampoo strips it of oils. Yes, the shampoo still touches my hair when I rinse it out, but I'm not washing my hair. For the most part, I rinse and condition. And here's the way I condition: I get in the shower. I rinse my hair by running water over it in the direction it grows. Then I smooth on conditioner, from root to tip, in the direction the hair grows. Meaning: I never tousle, scrunch, rumple, rub the wrong way, etc. I know how the ladies in commercials do it — with the hair all piled up on their heads, working and twirling the strands into a lather — but that will result in a tangled mess for me. Then I leave the conditioner on for five to seven minutes. My hair needs it, and loves it. While it's in there, I wash my body/face/etc. Then I rinse the conditioner out, turning the hot water down for a cool rinse, which is supposed to be better for your tresses and just feels good. Then, when I get out of the shower, I never ever ever towel dry my hair — it just makes it frizz. I brush it, spray on some gel, and then don't touch it. Not until it's dry. I offer all this detail as evidence that I take my hair care seriously. I don't spend a ton of time on it, but I want it to look great. And it's taken me years to come up with a system that works. And Pantene is an integral part of that system. I can go on vacation without taking face wash or face cream, but I would never go away for more than one night without my Pantene Pro-V. It is so worth it. Pantene Pro-V Curly Hair Series Conditioner, Dry to Moisturized, $4.99-$6.99 at Drugstore.com.